the chili is just like the president, it promises one thing(or taste) and all you get is a big let-down. Best chili ever thanks to the best President ever! We don,t only have the greastest President that ever, we also have a chilli making President , I like all the ingredient because of the choices of either trunkey or beef. Thanks Mr President , I will be cooking this chilli. 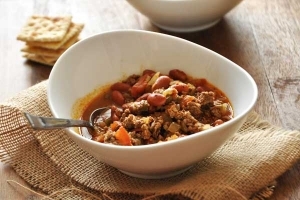 I love this recipe, it is the only one chilli that I feel is healthy for me! all natural ingredients, I make my own red beans, the only thing I changed (because I used natural roma tomatoes, is adding two teaspoons of tomato paste mixed with the red wine vinegar. LOVE IT LOVE IT . MADE IT THREE TIMES ALREADY! We finally got a president who has more class in his little finger than the whole Bush clan combined. Besides the fact that he is a very handsome and educated man! I am a big chili fan, but This one does not get my vote. 13 grams of fat on a diet website? I like tumeric and basil, but not in this dish. A properly written recipe will not be vague, in instrutions ("several tomatoes" - one more or less makes for a completely different dish). Good for ya, both the chile and an effective President that can speak in whole sentences and doesn't turn off our allies. I was surprised by the ingredients and will have to try it. With the name of the chili, I thought it would just be "full of crap" ingredients. is this a 17 day diet plan recipe? i know its off topic, but seriously what "freedoms" did obama take away? read this: also if healthcare is unconstitutional then the supreme court will repeal it justly. Great recipe,all u red necks need to go back to your red neck holes you all crawl from. Great recipe. Americans are lucky to finally have a President that makes a lot of sense! I love chili, but I wouldn't trust anything that arrogant narcissist recommends. What a stupid statement to make, "if it's good enough for the president..." I would love to have the healthcare he has! If it is good enough for him, it should be offered to the rest of us! I wouldn't try anything thing this man endorses or recommends anymore. I am a true American and I too respect the office just not the man. This man has but one agenda and that is to take away our freedom. If the people of the US don't wake up soon we will all be under a ruler not a president. WAKE UP AMERICA BEFORE IT IS TOO LATE. U started with this last election I hope sending a message to him and the rest of his cronies. Nancy Pelosi being the worst of the worst. The woman has been out in the CA. sun to long needs to go back. Obama is not a good president! Period:/ just like bush and Clinton...Obama- bin-lyin! This is America they are slowly doing away with our freedom, making us have to buy health care, if we could afford it we would get it! No more freedom, u can thank Obama. It looks like a good recipe..Let's stray away from politics and calm down!. If it's good enough for the President and He is "The President".. and I love chili!, it's good enough for me. This the wrong forum for the comments I have read. I love the name and the ingredients sound good so I am fired up to go make some. I love how health concious the first family is and I feel lucky to be an American with such a great leader! I,ll try it. As for the other comments, I learned one thing in the service and that is, to honor the office of the commander in chief, no matter the party. The person that holds that job will always have my respect. Very good, tried it once with lean beef and once with lean turkey. It tastes good and its healthy. Adding cinnamon over every serving. Thank you Mr. Obama, great recipe!